Cub Scouts and leaders should wear their "Class A" uniforms. It's OK if new Cub Scouts don't have their uniforms yet. Visiting the historic Fort provides numerous opportunities for rank advancement and electives. Check your handbook for participation in outdoor flag ceremonies, visiting historic homes, learning about American history, visiting an important place in the community, etc. Depending on the number of Fort visitors, we may break up into dens to visit the various buildings and historic sites within the Fort's walls. 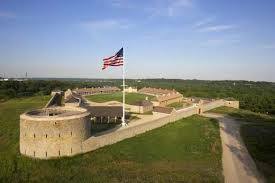 Link to more Historic Fort Snelling info. including an interactive map tour.